1. Framing. This is the way the audience is orientated to what the story is about. If I say to you: ‘Right! I’m going to climb this mountain and get to the top before Bob!’ then we know what my story is about. 2. Character. Stories are about characters interacting and making decisions in their story world. Characters generally have goals and aims; they are motivated to achieve these aims and there are reasons why their journey towards achieving their aims is interesting to follow. For example, there may be obstacles and conflicts that mean achieving their goals might be difficult. 3. Storification. When you read a story you do not remember the words on the page, you remember a mental ‘model of meaning’ that you built in mind for yourself. You become a ‘producer’ of the story as you make sense of the information you receive and gradually build this mental model. As you do this, the story breaks out of the story world and has structure and meaning to you in your mind and in your life. This is storification and is the most powerful dynamic in the finest stories. Understand the primary colours, and you understand story. 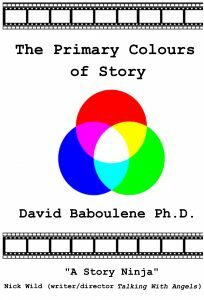 There’s a lot going on, so signup for a free introduction to understanding stories, followed by a regular email from me on the books, films, videos, story analysis, seminars (filmed seminar and new book on The Primary Colours of Story coming soon!) and other resources, and let’s turn you into a master of the craft of story! Subscribe to my story development goodness!